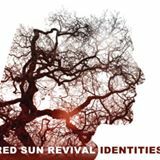 Red Sun Revival are proud to release our second full length album, ‘Identities’. It’s been a frantic year of writing, recording, and mixing, but it’s all been worth it. We’re delighted with this new album, and we hope you’ll enjoy it as much as we’ve enjoyed making it. ‘Identities’ is available now through ECHOZONE in G/A/S + Benelux, and through Resurrection Records in the UK and remaining territories. The album should also been available digitally via iTunes, Amazon etc, and can be purchased directly from the band via Bandcamp: https://redsunrevival.bandcamp.com/album/identities or from our shop. We’d like to thank all those who helped to make this possible: Stephen Carey (mixing and production), Dave Blackman (mastering), Simon Rippin (drums) Sam Morrison (additional keyboards), and Jonny Helm and Sarah Channing Wright (artwork). We’d also like to thank Jörg, Ulf, and Sabine of Echozone, and Andy of Resurrection Records for distributing ‘Identities’. Finally, our official release party will be at SOS Festival in London on the 8th August. Advance tickets are available from our shop.